Silicon strategy covers the gamut of quartz and metallurgical silicon to polysilicon. There has been a dearth of news regarding Schmid Silicon Technology (SST) since the Sunways AG enters polysilicon production business announcement and my Schmid Silicon Technology: From East Germany with Polysilicon post. Having secured land and mining rights at a location northeast of Taraz, Kazakhstan, construction of the mg-Si facility will start in July 2008, and silicon metal production is slated to start in the second half of 2009. SST claims the UMOSI process produces polysilicon with a cumulative cost structure 28% cheaper than the Siemens process. SST has partnered with Spectrum for “Monosilan Technology and Process Know-How” forming a joint venture called (I presume) Schmid Silicon Ukraine (SSU). And yet another joint venture, Schmid Silicon Engineering (SSE) has been formed with an unnamed EPC (engineering, procurement and construction) firm for engineering and chemical plant construction. SST plans to construct pilot production, TCS (Trichlorosilane, HSiCl3), and 6,000 metric ton (6 x 1000 metric tons) production facilities at the Schwarze Pumpe Industrial Park (Industriepark) located between Spremberg and Spreewitz, Germany. Per the SST schedule, the first 2,000 metric ton production facility will begin construction in the third quarter of 2008 and be commissioned in the fourth quarter of 2009. SST is still looking for additional investors in the 6,000 metric ton polysilicon fab (Silicon Fab “Schwarze Pumpe”) project in 1,000 metric ton modular clusters. SST touts silicon independence, scalability, cost savings at 6,000 metric ton scale, a 3 to 5 year return on investment (ROI), and “highly innovative technology and equipment with high potential for future development” as key investment drivers. conductor industry. 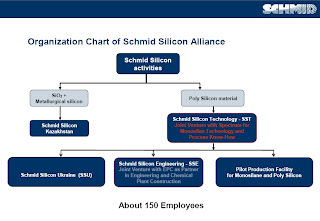 Will Schmid Silicon Technology operate these turnkey polysilicon plants for their customers or expect them to take the keys and drive as with Schmid’s turnkey production equipment solutions for solar wafers, cells, and modules? I believe many solar companies will find a “Fabless” polysilicon business model with guaranteed capacity at industry competitive costs attractive. And in 1366 Technologies Wins Solar Startup Competition, Ucilia Wang at Greentech Media reports that GreenVolts CEO Bob Cart “announced it is bidding for a 26-megawatt project that would ramp up to a capacity of 1,000 megawatts per year by 2015.” I wonder if this was the mysterious project mentioned in my post, GreenVolts at BIG Solar? 1) in your article you quote Schmid building a production facility for 150 Mio. EUR (I suppose) that enables them to produce 10000 MT of mg-Si = 6000 MT of polysilicon. REC Group and LDK have massive expansion plans. i.e. LDK builds the 16000 MT plant (15000+1000 MT) for 1,2 B. USD. now, if I compare the investment costs alone I wonder why the traditional polysilicon manufacturer are not selling off or for the long term should all go BK if Schmid/Timminco have such a huge competitive advantage. The USD $150 Million is being used to construct a plant to produce metallurgical silicon (mg-Si). mg-Si is about 98-99% pure and will be used by Schmid to make TCS (Trichlorosilane) for their polysilicon production process. The 6000 MT (Metric Ton) polysilicon plant will cost some USD $500+ Millions. I don’t think Schmid has disclosed a figure for this though I guessed a high USD $750 Million investment in my first post. Schmid Silicon is comparable to REC/MEMC/LDK but not Timminco. Timminco is taking mg-Si and refining it using metallurgical processes instead of the chemical/Siemens process approach. This is why Timminco’s capex is much lower than traditional polysilicon manufacturers.